When I went out to refill the bird feeders this evening I startled a large bird rummaging in the wood chips near the fence. It was a Northern Flicker and it blended in so well I didn’t even notice it was there until it flew up into the pine tree. I don’t see Flickers in my yard that often, maybe a few times a year. I ran in the house and grabbed my camera. The northern flicker is a medium-sized brown woodpecker patterned with black spots and bars and a black crescent on the breast. They have a white rump patch that’s visible in flight and sometimes when perched. There is also a flash of color in the wings visible in flight – yellow in eastern birds and red in the western residents. 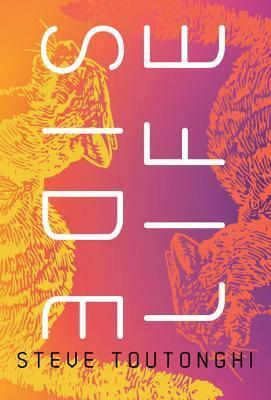 (Click on the photo to the left to see the yellow in the wing). Unlike most woodpeckers, which are usually found climbing the large branches of old trees, it’s not unusual to find a Flicker on the ground digging for bugs. 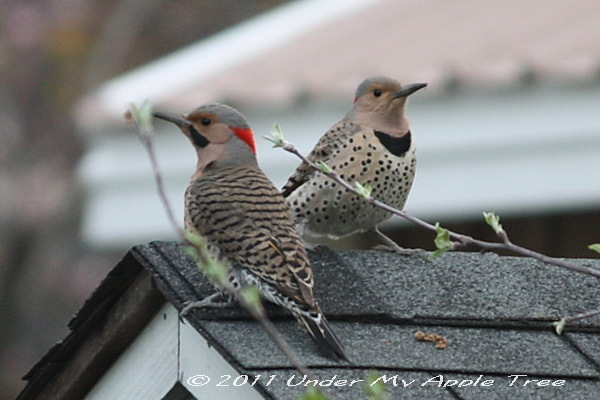 Soon a pair of Flickers reappeared in the yard. In the photo below the male is on the left and the female is on the right. The male is identified by the black moustache stripes which are absent in the female. After a few minutes of sitting on my garden shed they decided it was a good place to do a little mating. Yup, they did. Look close and you can see he’s standing on her back. 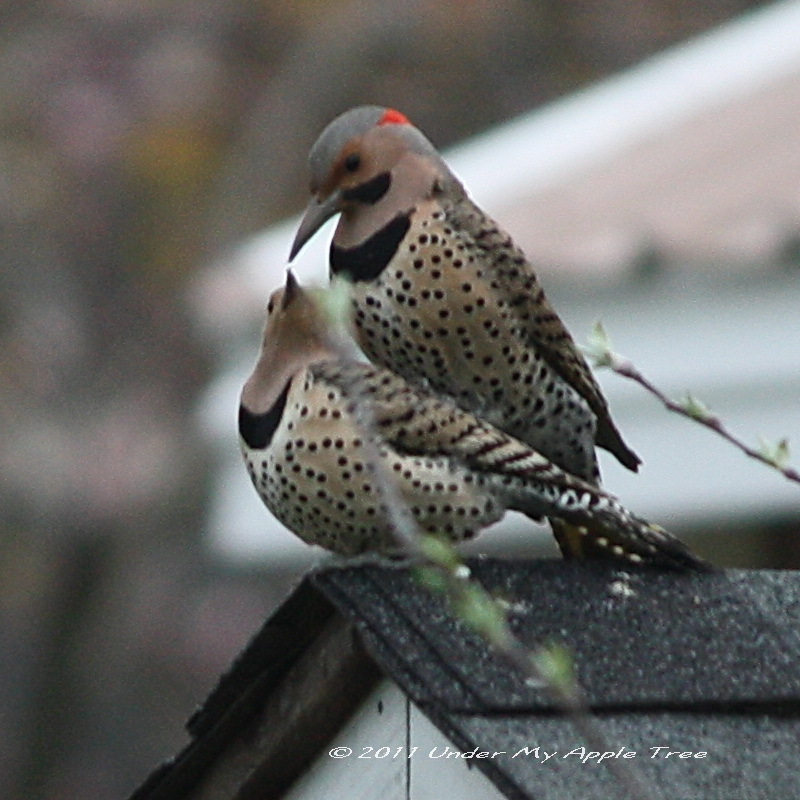 Most likely they have a nest in a nearby yard which is exciting because that means baby Flickers in a few months. Flickers prefer to find food on the ground using their long barbed tongue to lap up ants, a favorite. 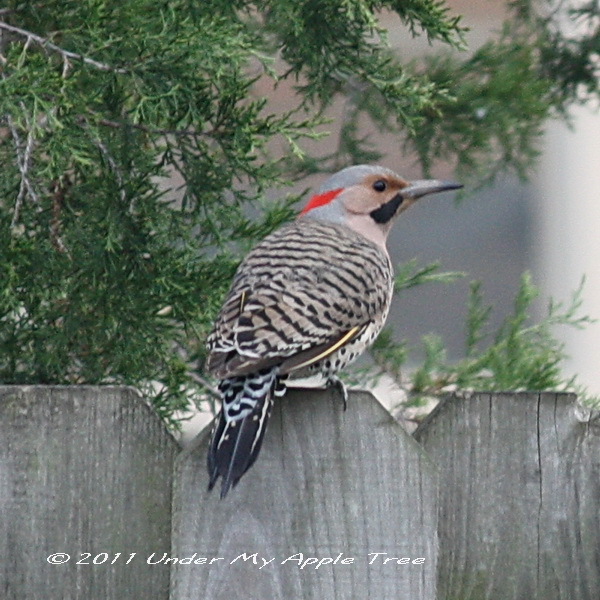 The Flicker is one of the few North American Woodpeckers that is migratory. Flickers nest in cavities in trees and both the male and female incubate the eggs. What a lovely post and some great shots. 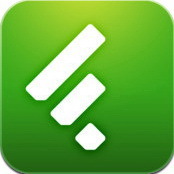 As the Flicker is not a bird native to our country, I am ashamed to say that I have not heard of it before. We do have Woodpeckers here in the UK, but they are quite elusive and not seen in most urban or rural gardens. Fortunately for me, our home backs onto a lightly wooded lane and from time to time the Lesser Spotted Woodpecker does visit the Oak tree right opposite my kitcken window, although he is usually only easily visible in the Spring and Autumn, when the tree is not shrouded by foliage. The Lesser Spotted looks like our Downy Woodpecker. Perhaps a distant relative? The Red-Headed Woodpecker is rare and never seen in my backyard but the other ones are quite friendly and stop by often. Lovely shots of the birds! Am looking forward to the coming migration of warblers to the Ohio area in May! A new bird to me – spotted a local bird, a redpoll at my backyard feeder. Too bad I didn’t have a camera handy! I have yet to see a redpoll although I heard they migrated farther south this winter and some people got to see them. I’ve already seen a few warblers and am going out for a walk today to see if I can spot a few more migrants before the trees get too leafy. One of my favourite birds. Awesome shots. We usually see one or two a year in our yard. They don’t usually stick around for very long. Just a couple of days and they are off again. I hope we get to see babies soon! They don’t stick around my yard either. I’m hoping there’s a nest nearby. Oh, I am a big fan of birds and birdhouses, but have never captured photos like these. Thanks for sharing…. Oh, they are gorgeous! I’ve really got to do something to draw a different variety of birds to my backyard. So far this year I’ve only seen junkos, starlings and bluejays. Try putting out a sunflower seed feeder. Lots of birds like sunflower. Even the ones that don’t eat seed will start to come in the yard when they see other birds around. Starlings can’t fit on those feeders, they would if they could, I think they’ll eat anything. Thanks for the advice! I looked the sunflower seed feeder up online and that looks like it would be perfect for the trees in our backyard. great shots leslie ..I love how the female is looking at the male during mating. I’m amazed at the shots you get, Leslie! I guess only the male has that red stripe? Really love this feature. Thanks… glad you enjoy it. The female has the red stripe too. She doesn’t have the black stripe or moustache under the eye. What a beautiful bird. I don’t think I’ve ever seen one before. You take the most incredible photos of birds! I look forward to stopping by each Saturday now. I love you bird pictures! These are wonderful. I particularly like the red stripe on the back. Wonderful photographs, especially the last one where they seem to be kissing! Fabulous photos. I love the detail! And who says stripes and polka dots don’t go together, LOL. So beautiful! They are lovely. Gorgeous photos! Any of these would be lovely on a notecard/stationery or framed … just beautiful! These birds are so hard to shoot! Beautiful.